Games are all about creating worlds and stories. The richer the world, the more immersive the game. The earliest video games (think Pong, 1972) were limited to flat, two-dimensional screen. But even so, Pong was awesome. Believe us, we played a lot of Pong (not to mention the several decades of games that followed). But gamers today want more. Detailed storytelling and immersive world building are now a standard in games. This means there’s increasing expectation for game worlds to be realistic 3D environments on larger scales. At the same time this shift was happening in gaming, smartphones, big data and machine learning have propelled maps from a flat image on paper to a highly-personalized, living model of the world. And it was at the intersection of these two things that we saw the chance to build something to enable developers to create a whole new class of gaming experiences. This is why we launched Google Maps Platform’s gaming solution last year. In the last year, five games launched on our platform and we’ve learned a lot about real-world games. Rich, dynamic, and contextual location data allows game developers to augment and enhance social and AR gaming experiences. This is why three of the top 10 ARCore games(1) in the last year were built on Google Maps Platform. When it comes to location-driven social, players can not only team up, but also have their unique location enrich multiplayer gaming. Next Games learned how powerful this can be in The Walking Dead: Our World. In the game, players form groups, known as guilds, and are able to send flares to allow other players in the same guild to virtually join them at their location to complete missions around the flare. When we asked about the impact location has had on the social experience of their game, Director Riku Suomela said, “If we didn’t have geolocation, the current system with social wouldn’t work.” In fact, ninety percent of the game’s daily active users are in a guild, and three out of every four players play the game with friends(2), so social engagement is high. Today, gamers are people of every age and walk of life. They are rushing commuters, busy shoppers, and people just going about their daily lives. Incorporating location into a mobile game helps developers make game play more immersive and more personal. Every new location gives players a chance to engage with a game differently. For example, players hunting monsters could find toothier ones near their dentist office or hungrier ones around restaurants. A real example of this is Ludia’s Jurassic World Alive. 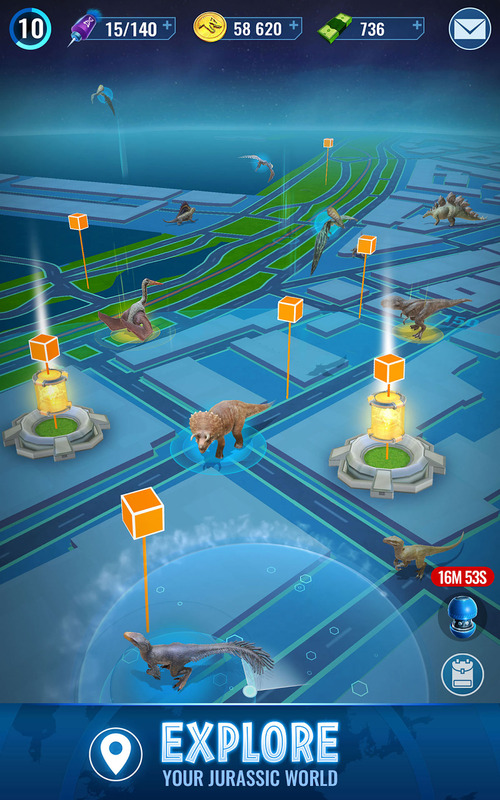 They found that players opened the game twice as often as Ludia’s non-location-based games. Similarly, Next Games’ The Walking Dead: Our World achieved a 54% higher seven day retention rate compared to the Top 50 US games average(3). When games connect with players where they are, in-game experiences become more immersive and this translates to a drastic increase in engagement and retention. When we started building Google Maps Platform’s gaming offer, we had a simple idea in mind: give developers the tools to build brand new real-world games. But thanks to creative partners, we realized the possibilities are even broader than we expected. Real-world games don’t need to be built from scratch––we’ve seen location intelligence bring new life to existing games, as well. mixi recently added a map mode to Monster Strike(4). In 2018, it became the highest-grossing mobile app of all time(5). Monster Strike was already a popular game but when mixi began re-engaging their user base with location-based in-game features, they saw a 30% increase in daily sessions per user, plus 50% of users who engaged with the location component played the game for 5 or more consecutive days. With mixi, we learned that game developers don’t need to wait for their next game release to start incorporating location into their gameplay. It can be a powerful new dimension to an existing game. Location-driven features and real-world gameplay do a lot more than just add to the experience of a game. They redefine it. We think this has incredible potential even beyond what we’ve already seen, and we’re excited to work with developers around the world to bring more real-world gaming experiences to life with Google Maps Platform. Whether you’re looking to get people racing across the real streets of Los Angeles, rescue survivors from zombies, or battle in futuristic landscapes located right in their own neighborhoods, the opportunities are vast. We can’t wait to work with you to build something awesome. Ready to learn more? Come to our Google booth or listen to our talk Tuesday, March 19th, 3:00-3:30 pm Room 2016 at West Hall at GDC or visit us at g.co/mapsplatform/gaming. (2) Source: 2019 Mobile Gamers Study; an online survey conducted by Honest Data, Inc. . n= 2,000 active mobile gamers in the United States, the United Kingdom, Canada, and Australia.